Minnesota’s 10,000-plus lakes and numerous rivers are just the place for fun on the water. On any given day thousands of boaters take advantage of the state’s most famous natural resource. Whether you want to cruise the shorelines on the mighty Lake Superior, or spend the day fishing on the mighty Mississippi, you can do it all in Minnesota!!! One of the most popular lakes is Lake Minnetonka. Lake Minnetonka is located 12 miles from downtown Minneapolis and features 15,000 acres, 110 miles of shorelines, and many hidden secluded coves for every type of boater. It’s no surprise that Minnesota has more registered watercraft per person than any other state. And today, the increasing popularity of boating along with the boom of personal watercraft (Jet Ski, wave runner, etc) have created more water traffic than ever. Unfortunately, the risk for boat collisions has also increased. Coast Guard data show that “collision with another vessel” is the number one type of recreational boating accident; “collision with a fixed object” is second. Whether you are fishing, water skiing or simply boating for the pleasure of being on the water, boat owners and operators must follow Minnesota boating rules to ensure their safety. Boating safety laws in Minnesota are meant to protect boaters and people in the surrounding water. Each person operating a boat has the responsibility of knowing the laws that govern boating in the state. A good knowledge of navigation is a must for any cruising sailor. You must have a complete knowledge of your boat, its handling and the boating rules of the road. Even the most cautious boaters can sometimes experience unexpected problems on the water. That’s why the U.S. Coast Guard recommends that all recreational boaters, including personal watercraft and paddle sport users, take advantage of the free Vessel Safety Check program every year. A Vessel Safety Check (VSC) is performed at your boat − ranging in locations from boat to your driveway. A vessel safety check usually takes 15 to 30 minutes, depending upon the size of your boat. Other boating law-enforcement & safety agency’s that your boat was in full compliance with all Federal and State boating laws during a safety check for that year. Best of all every Vessel Safety Check is 100% Free of charge! If your boat does not pass, no citation is issued at that time. Instead, you are provided a written report in how to correct any discrepancies. Why Receive a Vessel Safety Check? Safety! The peace of mind that your boat meets federal safety standards and that in an emergency, you will have the necessary equipment to save lives and summon help. Additionally, you will avoid substantial fines should you ever be boarded by the U.S. Coast Guard or other law enforcement and found to be in violation. In many cases boating insurance agencies offer discounts for vessel that undergo a Vessel Safety Check every year. All decals and safety checks are void December 31st of year they are inspected, they are also void should the operator /owner fail to maintain the vessels equipment or the vessel itself to the standard at the time of the safety check. In spite of your best efforts, when boaters hit the water, accidents can and do happen. Just like driving on the road, when you are on the water things can change in a split second. 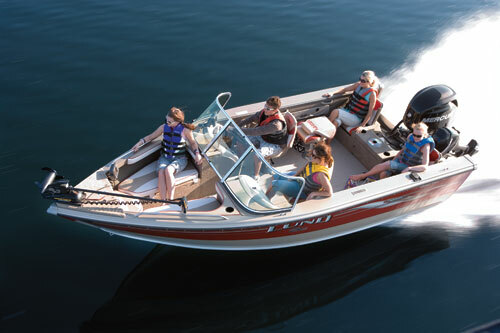 When they do you need the expertise of a Minnesota boat repair and restoration professional. Severe damage to boats often requires structural repairs. Structural damage compromises the integrity of the hull and your safety. Significant damage to the hull may cause the boat to flood with water or produce stress cracks which may develop into hull failure at a later time. After any significant collision or hard grounding, the boat should be hauled out of the water and the hull inspected for cracks, fractures of joints, or any other damage. Anchor Marine Repair can repair minor and major gel coat damage including chips, spider cracks or “crazing”, osmotic blistering also known as “boat pox”, scratches, de-laminations, gauges & color fading often called “chalking” etc. If your fiberglass or aluminum boat has any type of impact or structural damage, fractures, soft or rotted floors, transoms and/or stringers, we can help.